Recall that the FBI has long wanted government-accessible backdoors into our personal but encrypted communications. “Trust us,” FBI leadership assures us, “we wouldn’t misuse that access; we’ll only use for ‘criminal’ investigations, and only with government authorization.” And they’ve claimed in support of that wide-eyed innocence that they can’t break into over 7,000 cell phones in the pursuit of criminal investigations. Current FBI Director Christopher Wray even put the number at over 7,700. On Tuesday, the FBI told PCMag that a programming error resulted in a “significant overcounting” of the encrypted devices. “The FBI is currently conducting an in-depth review of how this over-counting previously occurred,” the agency said in a statement. 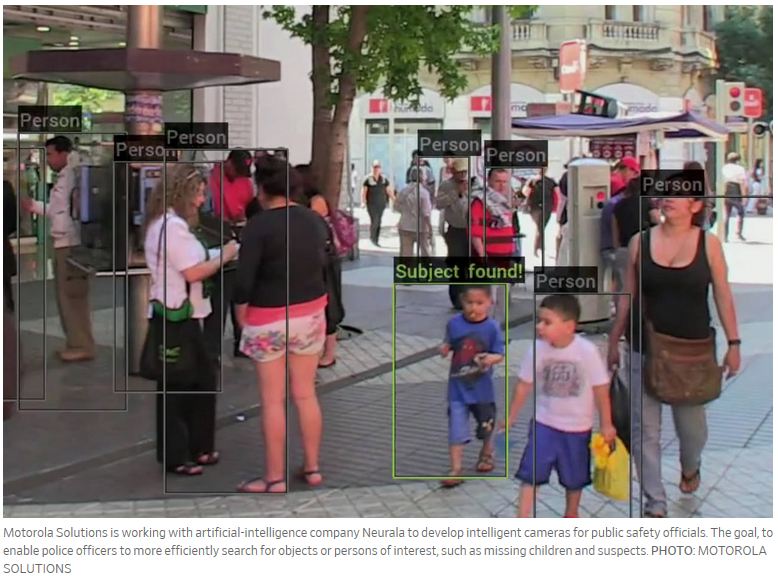 Police forces around the nation are on the verge of getting Artificial Intelligence assistance in identifying folks of interest to them in real time on our cities’ streets. The image below and its caption illustrate the thing. I’m all for assisting the police, especially regarding the subject of that cynically tear-jerking caption. But this sort of thing needs to be looked at with a very jaundiced eye. It isn’t too far away from what the People’s Republic of China already is doing in terms of routine surveillance and tracking of everyone. That’s actually a serious question. The firestorm over Facebook Inc’s handling of personal data raises a question for those pondering a regulatory response: is there such a thing as too much privacy? Law-enforcement agencies rely on access to user data as an important tool for tracking criminals or preventing terrorist attacks. As such, they have long argued additional regulation may be harmful to national security. Unfortunately, no government can be trusted with citizens’ privacy, as the Star Chamber secret FISA court, the FBI leadership (and not just the current or immediately prior crowd—recall J Edgar Hoover), prior DoJ leadership, the Robert Mueller “investigation,” and much more demonstrate. The Supreme Court has a case before it, Carpenter v US (it heard oral argument Wednesday), concerning the 4th Amendment and the personal data of a defendant in the form of his cell phone location data. The data were obtained from the cell phone company by police without first getting a search warrant. There is precedent. The high court reasoned then [in ’70s cases involving business records that banks and landline phone companies maintain about customer transactions and that the Supreme Court then reasoned police could seize without warrants] that individuals had voluntarily revealed their financial transactions or numbers they dialed to a third party—the bank or phone company—and so had forfeited any privacy interest in that information. That’s the position of FBI Director Christopher Wray. To put it mildly, this [mobile device encryption] is a huge, huge problem. It impacts investigations across the board. Certainly, consumer-done encryption of our communications devices can temporarily hinder investigations of the criminals who also use this encryption. But as the FBI demonstrated regarding an encrypted cell phone involved in the San Bernardino terrorist attack, its initial claims notwithstanding, the encryption can be broken without the cooperation of the device’s owner. Attorney General Jeff Sessions has withdrawn President Barack Obama’s (D) blanket hold on asset seizure, but with safeguards. I think those safeguards need improvement. Stop sharing seized assets with local law enforcement. Each State has its own laws regarding asset seizure by local law enforcement; these laws should be respected and not bypassed. Sessions’ new guidelines say that state or local agencies seeking forfeiture under federal law must demonstrate probable cause within 15 days of the seizure. The sponsoring federal agency must notify the property’s owner within 45 days, so he can challenge it, including by going to court. France wants to enforce a “right to be forgotten” law (recently enacted by the EU that allows persons to demand publicly available information about them to be erased from links in search engine results) inside other nations than the EU membership—inside the United States, for instance. Google, et al., is demurring, and France has taken the matter to the EU’s highest administrative court, the Court of Justice. The case will help determine how far EU regulators can go in enforcing the bloc’s strict new privacy law…. Another word for Government’s prior restraint of private citizens, a word used by Holman Jenkins in his Friday op-ed to disguise this assault on our freedoms. Let’s face it, with big data, with impersonal algorithms that could track every earthly resident’s web activity, travels, purchases and electronic interactions with the world, it might be quite possible to know whose life and personality are disintegrating, who might seek to resolve the impasse by going on murder binge.